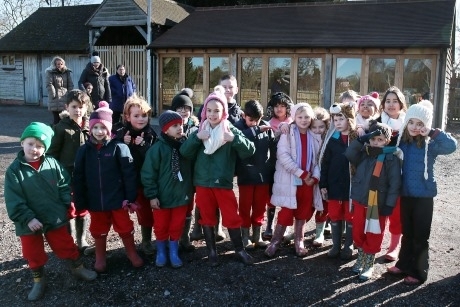 Students can head out on a journey of learning and discovery, in Windsor Great Park’s outdoor and indoor classrooms as the site’s environmental centre reopens for another year. Located in the heart of Windsor Great Park, the Windsor Great Park Environmental Centre allows pupils to experience wildlife and discover nature in the spectacular setting. Imaginative activities form the crux of the centre’s programmes, with links to Early Learning Goals, Science and Geography, among other subjects. . The sessions, which are available for Primary schools, also provide opportunities for pupils to develop their literacy and numeracy skills, whilst taking part in programmes run in forest and grassland. Windsor Woodland Animal Adventure – Aimed at Early Years and Key Stage 1, this session will see children head out on an adventure in the woods, to learn the secrets of how wild animals survive. Hands on activities include a paw-print puzzle and making mini shelters. Pretty Plants and Buzzy Bees – Children from Key Stage 1 and 2 will be encouraged to make a paper pot, sow seeds, learn about the parts of a plant, play team games and dress up as a bee to pollinate a flower during this session. Intriguing Trees – Pupils from upper Key Stage 1 and 2 will follow the tree trail to learn about the lifecycle of the trees, learn the names of the trees using a key and plant a tree seed to grow one of their own. Fully-led days for pre-booked school visits are available January to October. Trips typically run from 10am-2.30pm, but timings can be flexible. Groups of up to 30 children can be accommodated on any day. To book a trip, schools can email berkshireeducation@bbowt.org.uk or call 07493 649 667. For more information, visit www.bbowt.org.uk/discover-learn. The HRH The Duchess of Cambridge has championed outdoor learning in a session with The Garden Classroom (TGC) charity involving local schoolchildren. An exhibition of science and contemporary art will throw new light on the world of bees and other native pollinators at Cornwall’s Eden Project.